Nursery Furniture Safety - Which? Follow our tips to make sure your child's nursery is a safe haven for sleeping, feeding and playing. Make sure your baby isn't able to grab blind or curtain cords, or anything hanging from the window that could pose a strangulation risk. Where possible, get blinds without cords, and tie up anything that could be grabbed so that it's out of reach. Position furniture away from windows to further reduce risk. Windows should also be fitted with safety locks to prevent babies from opening them. Once your baby becomes more mobile, you'll need to safety-proof the door of the nursery. A door slam stopper can help prevent doors from shutting on little fingers or getting trapped in the hinge side - you can buy different types for each side. Modern sockets will be wired with in-built safety hazard protection, so there's no need to use socket covers - as they may actually pose an increased safety risk. Make sure cables are safety tucked away out of your child's reach and where you won't trip over them in the middle of the night during a half-asleep feed. 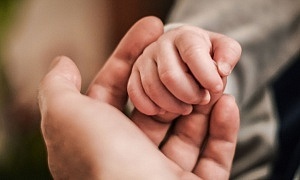 While you're babyproofing, check that you have all your essential baby safety equipment. Audible smoke alarms and a carbon monoxide alarm should be placed in your hallway and, if you have more than one floor, on each level at the top and bottom of the stairs. Lead used to be commonly used in paint, so if you're in an old house with original paint, you can over-coat it with a fresh layer of new paint. Check if any of your paint is cracking or peeling, as this will also need to be fixed before your baby takes up residence in the room. If you're redoing the paint job, you need to allow at least eight weeks for it to dry and the room to air out before moving the baby in. Avoid placing the cot next to a window or against radiators to keep temperature under control and to make sure your baby isn't being exposed to heavy direct sunlight or draughts. 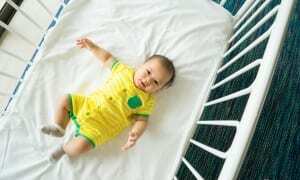 When your baby becomes more mobile, they'll start to climb, so, as well as keeping the cot away from windows, it's good idea to keep it away from the dresser or changing table, or any other furniture that could be climbed on. Remember to anchor furniture, such as dressers and changing tables, to the wall, and check all furniture is tightly screwed together and stable, so it won't topple. Read our guide on using cot beds safely before you set one up and position it in your nursery. If you're using a second-hand or borrowed cot, it's especially important to check its sturdiness and stability. Make sure the distance between each bar is no more than 6.5cm, and that there is at least 50cm between the top of the mattress and top of the cot. Check there are no protrusions that baby clothing or other items could get caught on. If the cot has a drop-side mechanism, ensure that it's secure and tamper-proof.